Placed at a proximate distance from the famous tourist attractions, Buddha Retreat provides a relaxing stay. 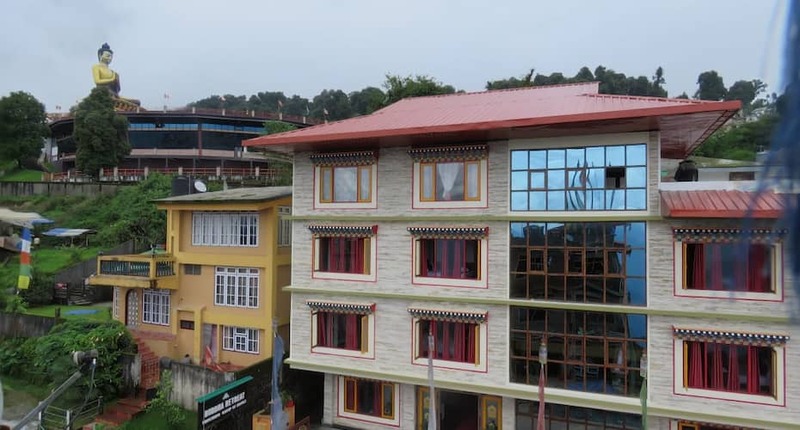 Placed at a mere distance from Buddha Park, Buddha Retreat provides comfortable accommodation in Ravangla offering complimentary internet access and breakfast service to its guests. It comprises of 18 well-kept and spacious rooms spread across 2 floors. Each room has amenities like television, wakeup calls, telephone, tea/coffee maker, room heater, bottled/drinking water, wardrobe and bathroom with hot water facility. Some facilities include 24-hour front desk, banquet facilities, business center, garden, luggage storage, travel counter, security guard, backup generator and parking to name a few. Buddha Retreat in Ravangla also offers services like room service, airport shuttle (surcharge), express check-in/check-out, medical assistance and laundry to its guests. Buddha Retreat in Ravangla is accessible via travel hubs such as Darjeeling Railway Station (71 km) and Bagdogra Airport (129 km). Places worth a visit include Bhaleydhunga (3 km) and Titanic View Point Ralong Namlung (6 km). Guest can dine-in at the restaurant, bar and coffee shop within the premises. What people love the most about this property is its great location and classy ambiance. Book now and enjoy world-class services at Buddha Retreat. This is the best hotel one can get in this small town. Moreover, its at a walk-able distance from the buddha park, the only attraction. The hotel is decent and so are the rooms. Staff is polite. Overall, good experience. We stopped here for lunch on our way from Gangtok to Pelling. They almost ruined our journey by serving lunch, two simple biriyanis after almost 90 minutes of placing the order. The guy serving us was chewing something prominently while serving and taking our orders. We actually stopped here considering the washrooms would be clean but we did not have any luck, it was too expensive, anything did not make sense. This hotel is best in all criteria be it cleanliness, location (with respect to buddha park), room amenities, food, maintenence, room size etc. But something that makes it special is the cordial behavior of its staff and their willingness to serve you with the best they can. Only down side is a house built just opposite the hotel which obstructs the view a little but everything else will certainly win your heart here. Sorry for having underestimated Ravangla. I had little expectations in the fairly remote Ravangla, but the Hotel Buddha Retreat is really nice and modern designed. Newly built, nice bathroom, a very comfortable bed and a little heater-fan made our stay very comfortable. Good restaurant and helpful staff. We coukd not gave asked for more. Thank you for our nice stay! It was the last destination of our West Sikim tour in September 2018.In the evening of 22nd September with cloud and rain we have checked in the hotel.We have booked three rooms from Kolkata through Ankur travels for 8 heads including one 9+ child.The room they have given us was good but the food was too bad and costly.Next day during chekeout they have charged 2000/-for extra 2person including the child . Everywhere no extra charges charged for 9+ child.But the hotel was not agreed with me and I have to pay the money.They have shown me a mail regarding this from head office which was not sent to me after booking. It was a bad experience only in this hotel in West Sikim. Opt for the valley view rooms is available.